Like it or not, one of the guests, not too clever, he will drop some beer. The coasters are essential in these cases. 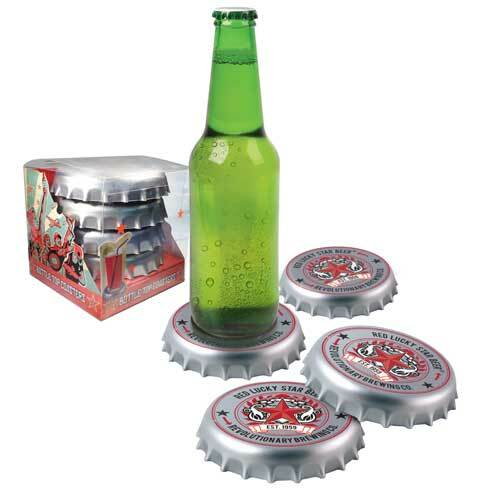 If the last time you went to a friend's house, noticed that still remains on the table spot of the evening for a couple of months ago, do not hesitate to give her this game shaped metal coasters beer. For some people, the coasters are like umbrellas, prefer not to use them as a symbol of rebellion or just sheer apathy. That's what this original game. The friend in question is not the veto by its attractive appearance. Do not betray its principles anti-coasters, since they are a tribute to the fan of beer. Are circular and decorated as if it were a bottle plate. A perfect combination for a pleasant evening. Over time you will see how the stains will disappear from the table and your friend will bring with pride coasters beers and requiring guests to place your bottle on them. Besides its functionality are very worked on an aesthetic level. Silver, each piece displays a red star on a background typical of more traditional veneers. Thus, coasters are fun but with an elegant touch. Ideal, as we say, to give to young people accustomed to meet friends. If you are past the days when you took home the cup holder of your favorite beer and you need to renew your stock, think these coasters shaped plate of beer, which are both functional and aesthetically appealing.